It was Eve who first introduced me to Heyworth’s, an elegant ladies department store in Cambridge which closed its doors 49 years ago. 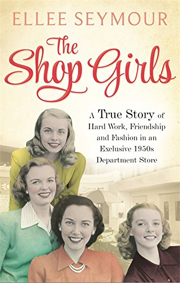 I had never heard of it before, like most people, and yet its memories are still vivid and nostalgic for the shop girls who worked there in a bygone era during the 1940s-60s when courtesy and an immaculate appearance were the order of the day. They are heartwarming memories which I hope you will enjoy reading about. Eve’s story is the first in a series of e-books being released in the run-up to the publication of The Shop Girls, on 25 September. Shy and sweet, Eve started working at the store when she was 14-years-old, having been offered the position by George Heyworth, a kindly man, who only upset her once when he refused to give a Saturday off to be a bridesmaid; having a Saturday was strictly forbidden, unless it was for a holiday. Her patience and romance with Les, a former Japanese prisoner of war haunted by the atrocities he had witnessed, led to a long and happy marriage, though this remained part of his life which he kept to himself; Les could only talk about those terrifying days to his fellow comrades who had suffered the same way in prison camps in the Far East. I loved Eve’s story because she described so many elements of life 60 years ago that no longer exists today and seem unbelievable, for example, being taken by ambulance to a convalescence home by the seaside to recover from an operation – all on the NHS. It is a rich record of social history. Eve’s chapters also includes the sad death of a shop girl, “Molly with the mocks”, the name given for the inferior brand of nylons she wore. Molly was a fun loving shop girl who was tragically killed in a bus on her way home from a dance at an American air base at RAF Lakenheath. It was a death which rocked the store. Eve was an assistant in the childlren’s wear department, but she didn’t feel comfortable serving the posh ladies who called in. She felt more at ease serving the gypsy ladies who visited the store when the annual Midsummer Fair visited Cambridge – it could almost be a scene straight from My Big Fat Gyspy Wedding for tiny tots. To find out what more about this, and Eve’s other fabulous stories, you can buy the book. I hope you enjoy Eve’s lovely story, it will be available 31 July for Kindle download from this link. *Many thanks to Ian McKendrick for his brilliant artwork on my dedicated page, The Shop Girls.